Hi Thomas. I too have been thinking about the SAMR model for some time. 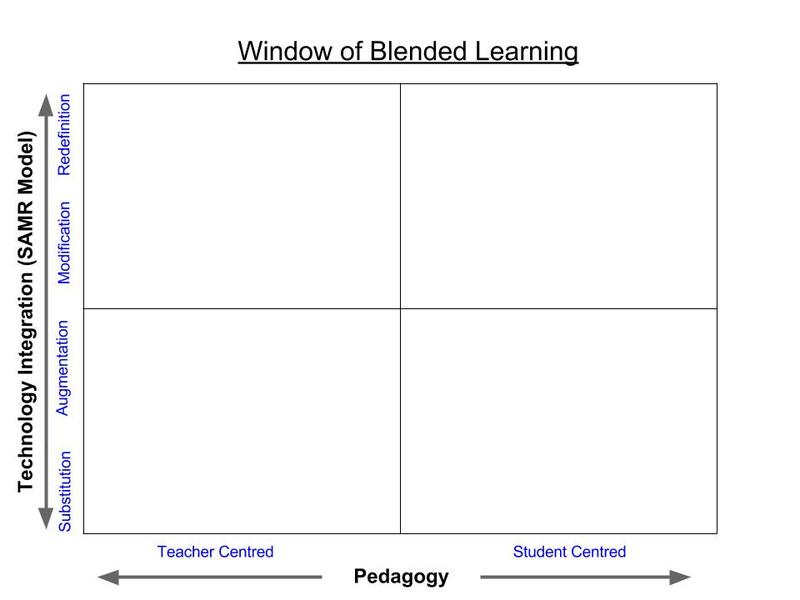 I find Silvia Tolisano’s interpretation useful: http://langwitches.org/blog/2011/05/07/a-timeline-tool-set-skill-set-mind-set/ ; but, your Window of Blended Learning suggests terrific teacher reflection possibilities. Do you think that creating a Google doc with the Window of Blended Learning for anyone to add to and comment is doable? Thanks for sharing the link Julie. Funny that you should ask about a Google Doc. I created the Model using a Google Presentation. I was actually contemplating posting the G Doc for others to post their thinking on the model but wasn’t sure. But since you’ve asked I’ve posted it in the blog post. Thanks for commenting. I think this is an excellent reflection tool. Thank you Julie for sharing Thomas’ blog post! Were you just wanting feedback and comments on it, or would you actually like people to fill in the quadrants with different examples? I would welcome feedback on the model as well as descriptors that could go in each quadrant. Hey, Thomas – Loving the concept here and the reflective / coaching possibilities that can come from it. I am, however, struggling with the 4 quadrant framework. I’m not sure the Johari Window model fits. The reason I say this is that it seems to be chunking “Substitution” and “Augmentation” in one realm, and “Modification” / “Redefinition” in another. The result of this is that the comments in each quadrant seem to infer that there isn’t much difference between those pairs when, in fact, there is much. This is especially true as we approach the “Redefinition” stage – a leap from “modification” most definitely as we “throw away the proverbial binder” and respond to student needs in ways that were impossible to fathom prior to the advent of these technologies. 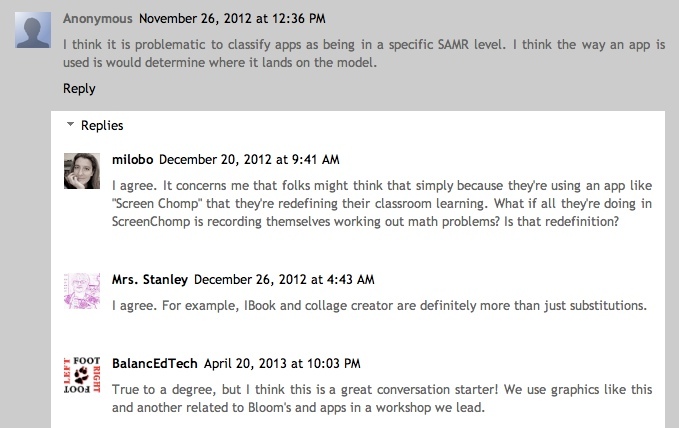 Let’s look at the above example for screencasting. If a teacher were to create a screencast of some aspect of learning for their classroom we could easily place it in the realm of substitution (i.e. the teacher used to stand in front of the class and do it and now they record it for viewing in the class). Here they have substituted live teaching for pre-recorded. This technology has been around for quite some time and is therefore not new. The same could be said for substituting a blackboard for a Smart Board at the most rudimentary of levels. To augment this, the teacher could make this video available online to be viewed by the student again and again, on their own time and point of readiness, or just to study, refresh, reactivate. The task is clearly the same – the teacher is sending a message and the student is receiving exactly what the teacher is sending with no further inquiry – but it is augmented and enhanced as it is not constrained by a temporal moment or a geographical space. To chunk these two pillars of the SAMR model doesn’t seem to honour the differences and nuances of each. To modify this example, the teacher could embed hotspots in the video, links that extend the teaching beyond the produced video and into the web where students can extend their learning and explore beyond the prescribed text or learning object. We are closer to student inquiry here but the task is still teacher driven and created. This pillar, “Modification”, cannot (IMHO), however, be blended into that of “Redefinition” where “teaching” lies more in the realm of the student. In fact, I may even see the “Student” as the “Teacher” by the time we reach the Redefinition stage – roles interchangeable – both co-learners and co-supportive. Just brainstorming here, but how about an eight quadrant model that allows for the pillars of the SAMR model to be separated and explored individually. This way, each facet is clearly isolated and the relationships between them highlighted. I think then the power of the model becomes clear and also easier to mesh with the TPACK model that compliments it. What are your thoughts on this? Great thinking and suggestions. I was thinking of the idea of a 4 row x 2 column window and had the same questions about having a separate row for each level of the SAMR model. I definitely agree with your statement that the 2 rows can infer that there is much difference between substitution/augmentation and modification/redefinition. I also considered with going with a frameless window with no quadrants and just an open box. If it’s truly a continuum should there be any quadrants. I noticed that Ruben categorizes Substitution and Augmentation under enhancement and Modification and Redefinition under transformation. So if it was to stay as a 2 x 2 window, then it could be enhancement and transformation. I’m not tied to any specific model. I just went with a 2 x 2 as a starting but definitely welcome input like yours. I’ll throw up a few variations and see what people think. Yeah – let’s play with a few different tables and see what we can establish. I love the creation of a tool to get us all thinking of how we perceive blended learning, our proficiency and understanding, and the skillset / mindset that is necessary to fully transform learning – often through tools but not dependent on them. Mark Verbeek (@beekfitness) and I were just discussing this as well and also discussed the enhancement chunking of Substitution / Augmentation but were thinking that the SAMR model on the y axis is linear top to bottom but input is made linearly from top to bottom (not really aligning with the labels as a result). What if we considered a 4 row x 2 column table with the bottom two rows labelled “Enhancement” and the top two rows labeled “Transformation” – perhaps with a dotted line or something. This way the nuances of S-A-M-R are retained and the chunking of pairs retained as well. Again, just brainstorming to capture the thinking. How can we get the idea across that “redefinition” also redefines the role of teacher and of student? How can we blend the teacher and student fields in the redefinition area to visually represent this? Perhaps a merged cell or dotted line to indicate permeability? Threw up some more variations for you. Based on your additional ideas, I think we can come up with something great. I’m liking the evolution of this model based on the collective insight from others. What would it look like if you merged the Cartesian plane and the French Doors? …and what if the arrow tip was removed from the teacher centre side and the substitution side? These would need to be cleaned up but wanted to play a bit with the models. With this one (https://docs.google.com/file/d/0B98fdOYOzI4DVm5DQ2cwTGVVWDA/edit?usp=sharing) I have merged the Cartesian Plane and French Door models, which I think nicely visualizes and blends the strengths of both (I think this is my favourite at this point). Now, let’s think really radically with this one (https://docs.google.com/file/d/0B98fdOYOzI4DeUZjdEhReXNMVGc/edit?usp=sharing). My thought process here is that the teacher comes closer to the realm of student, facilitator, guide, and the student comes closer to the realm of the teacher as a result as pedagogy / learning reaches redefinition. I’m not sure that I’ve captured that thought yet with this image but the gradual progression of Substitution –> Redefinition appears nicely represented on a gradual incline with the student becoming the teacher through inquiry. It’s messy I know but do you feel my thought process here? I so love the idea of reflective practice when it comes to Blended Learning… as the eLC (Blended Learning / eLearning Contact) for my board I am striving to have teachers reflect on how to push past the substitution and get to the ‘good stuff’ in the SAMR model. This post has struck a nerve of sorts as I just received an email from our Ed Tech secondary person who had this question asked about virtual learning – ‘How do we use blended learning for more than just homework – need to use it more valuably in class.’ The value of blended is inexhaustible and it goes wherever the students and teacher take it on their learning journey – but how do they get themselves there? With our Ed Tech initiative (we are in year 3 of 5 – each teacher gets a netbook/tablet, interactive projector and a 8 pack of student netbook/tablets – K to 12!) one would think that we are past the idea of substitution as a board with open availability of technology at the point of instruction – but we have missed the mark as teachers have not had enough of a nudge (gentle shove!) towards reflection practice and change in pedagogy that goes with the venture into blended. It is like the technology orb in the TPACK model sits or bounces on top of the pedagogy and content knowledge orbs… never really merges in and changes both. It would also be nice if self reflection was an intuitive skillset – it is not… People tend not to be good self reflectors… they need some guiding questions to reach the point where the SAMR matrix/quads/french doors might make sense to use. Peter Pappas has given some direction in his blog post: The Reflective Teacher (http://www.peterpappas.com/2010/01/reflective-teacher-taxonomy-reflection.html#content) and there is one for self reflective principals too!!. There are guiding questions that help teachers dissect the lesson/daily learning/practice. These questions are tied into the Bloom’s Taxonomy of learning… lets all venture up the ladder people!! Also for the neophyte or new to the idea of technology at the point of learning trying to figure out where I am and how am I going (basically like trying to figure out my own Learning Goals and Success Criteria by myself for effective use the technology in my classroom) is difficult because again you don’t know what you don’t know….The Technology Integration Matrix (http://fcit.usf.edu/matrix/matrix.php) has videos and lessons that demonstrate the change from one place to another on the matrix… it can be applied to the SAMR model almost directly. It gives teachers an idea of where they are as they can reflect themselves off of the examples for comparison. Hi Thomas, We’d love to integrate this into a Professional Development Seminar on Blended Learning. Please contact me directly so we can go over specifics, heathergunsallus@redbirdlearning.com.